There are conflicting reports that early mobilisation and outpatient-based surgery is associated with higher prevalence of seroma formation. Current comparative retrospective study was carried out to establish whether ambulatory surgery and early mobilisation has an impact on any higher incidence of seroma formation. 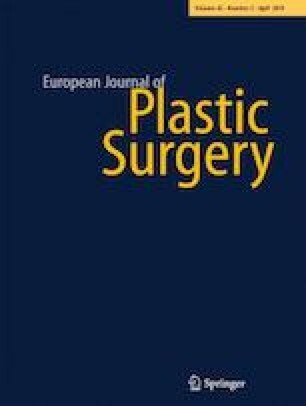 A retrospective analysis of 112 cases of consecutive lipoabdominoplasties with progressive tension sutures was carried out. Patients were divided into groups A, B and C.
Group A included 27 patients and were operated as ambulatory cases, with mean age of 36.1 ± 6.98 years and mean BMI of 23.8 ± 3.02. Mean tissue excised was 592 ± 373 g, mean volume of lipoaspirate to abdomen was 352 cc ± 158 and mean 1st 24-h drainage was 26.9 ± 17.24 cc. No patient had seroma. Group B included 68 patients who stayed one night with a mean age of 40.6 ± 11.36 years, mean BMI of 27.4 ± 5.34, tissue excised was 863 ± 544 g, mean volume of lipoaspirate to abdomen was 649 cc ± 510 and mean 1st 24-h drainage was 52.1 ± 58.8 cc. No patient had seroma. Group C included 17 patients who stayed in for two nights as inpatients. Mean age was 38.8 ± 9.66 years, mean body mass index (BMI) of 27.0 ± 4.06. Tissue excised was 927 ± 434 g, mean volume of lipoaspirate was 563 cc ± 316. Mean 1st and 2nd 24-h drainage was 80.1 ± 44.55 cc and 64.8 ± 42.4 cc respectively. No patient had seroma. Based on the study design, it is possible to conclude that early ambulation most likely did not contribute to seroma formation diagnosed by clinical examination alone in this series. Level of Evidence IV. Risk/prognostic study. The research involved the collection or study of existing data, records. The investigator records the data in an anonymous manner such that subjects cannot be identified directly or through identifiers linked to the subject. For this type of retrospective, anonymous data analysis and study, no ethics committee approval was sought. Mr. Umar Daraz Khan declares that he has no conflict of interest. Patients provided written consent for the use of their images. The author has not received research funding for this manuscript.